The Pro Truck Nationals series kicked off its 2010 race season at the IOK 4-Wheelers “Gravelrama” Grounds in Cleves, OH during the annual IOK Spring Fling event. Excitement was definitely in the air as a new season of racing kicked off for the Midwest-based series. Racers from Ohio, Indiana, Kentucky, Michigan, Missouri, Iowa, and Illinois were fired up and put on a great show in Cleves. 2010 marked the 12th edition of the Heartland Nationals at Atoka Motorsports Park in Atoka, OK. This year’s version saw the trademark warm temps & high humidity, but lacked the passing rain storms throughout the weekend that are normally seen in SE Oklahoma this time of year. This set the scene for another great Heartland Nationals with racers coming in from as far away as Washington, Arizona, California, and Michigan for this event. The NSDA Walt’s RV Summer Nationals at Lake Elsinore Motorsports Complex was another typical NSDA event with close racing and high action. Despite hot weather, racers came close to rewriting the record books. Those on hand saw a quality event start to finish. Here’s a look at the action. The 2nd Annual Battle at Big River saw some great racing throughout the Gallay Motorsports Quick 16 as well as the regular bracket class action. Here is a recap of some of the big stories from this event through photos from Rick Berry of RixPix Digital Action Photography. You can view Rick’s full assortment of photos from Big River Sand Drags & other events that he shoots at www.rixpixonline.com. 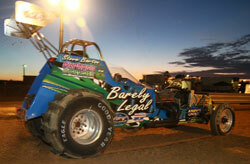 The second annual Battle at Big River saw a record breaking performance in the Gallay Motorsports Quick 16 Shootout. Josh Stephens not only took the final round victory over David Risher, but also took home the A/4WD World Record with a 2.869/121.75mph blast in qualifying. Competition was also tight throughout the rest of Big River Sand Drags regular program. Mike Orness made the haul from Iowa pay off with a win in the Comp Eliminator class. Art Gordon topped the Outlaw ATV category. Other winners on the night included David Mallow (Pro Index), Chris Loy (Vehicle ET), Fred Dannenburger (Unlimited ATV), Christopher Andrews (Super Pro ATV), and Jason Waller Jr. (Juniors). West Michigan Sand Dragway in Mears, MI held their first two events of the 2010 race season on May 15 and 29. The big winner Memorial Weekend was Ed Engel as he drove his Dragonfly Buggy to the Quick 8 class win over Frank Martuscelli. Read on for full results from both events. Here is a look at some of the top performers and stories from the 12th Annual Heartland Nationals at Atoka Motorsports Park in Atoka, OK. These photos are courtesy of the hard working team of Gary and Michelle Burrow at Lone Star Graphics – www.LoneStarGraphics.com. They put a ton of miles on to get from race to race and brave the heat to take these great photos. Be sure to check out their web site and all of the products they have to offer.